Traveling for work has its ups and downs. When I’m on the road for a week at a time, exploring the cities I’m working in by bicycle helps keep me fit and happy. Nashville sits at the top of my list for bike-friendly cities in the southeast. 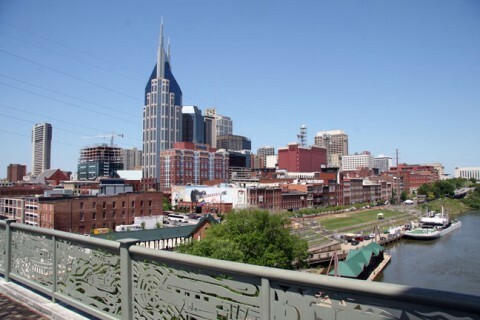 I’ve always enjoyed riding in the Music City, exploring endless routing options that visit historic sites like Fort Nashborough and the Bicentennial Capitol Mall. Whether you’re a local or just passing through like me, setting out on a bicycle can open up a whole new perspective on the city. If you don’t have your own bike, Nashville boasts one of the first free rental programs among southern cities. With locations all over town, Nashville GreenBikes takes away almost any excuse you might have not to be self-propelled. With locations all over town, it’s incredibly easy to grab a bike and immediately set out on the 179 miles of greenways and bike lanes through town. If you’re a little pickier about your ride (or just looking for a specific size or style), Trace Bikes offers affordable rentals as well. With your helmet on and tires pumped up, you’re ready to hit the town rolling. My last work trip to Nashville coincided nicely with the opening of the Music City Bikeway in March, an unprecedented 26-mile route that safely links eastern Davidson County with west Nashville. If you’ve got a full day to ride, begin your trek downtown with a leisurely 3 mile pedal to Shelby Park, following Davidson Street and the Cumberland River along the new Bikeway. Note that just after crossing the river, you’ll pedal around the massive LP Field, home of the Tennessee Titans. In about 20 minutes, you’ll arrive at Shelby Park, which boasts over 1,000 acres of green space. To really get a grasp for Nashville’s natural landscape, take a short break at the Shelby Bottoms Nature Center, where you can check out exhibits of the local flora and fauna and relax in the organic garden. It’s also the trailhead for 5 miles of primitive trails. Shelby Park could fill a whole day, but when you’re ready, head back along the Bikeway to downtown. This time, you’ll cross the Cumberland on the Shelby Street Pedestrian Bridge (pictured above). Take a moment to soak in the vista, free of car traffic around you. Next, take a right after crossing the river (there’s a GreenBikes station right here), and enjoy one of Nashville’s best assets, the greenspace of the Metro Riverfront Park. You’ll soon pass Fort Nashborough, a landmark worth taking a break at. This log reconstruction harkens back to the days when Nashville was still our country’s ‘wild west,’ settled by hardy frontiersmen in the late 18th century. Although closed for repairs when I last visited, it’s still a fun diversion from the outside the wooden gates. Follow the river north, letting the Bikeway signs guide you all the way to the pedestrian/bike dedicated Cumberland River Greenway connector to the Bicentennial Mall. Located smack in the middle of the city, this state park is home to the Nashville Farmer’s Market. The park’s visitor center is also home to a fantastic new Civil War exhibit, the ‘Struggle for the Heartland, 1861-1865. Even if you’re not a history buff, the timely nature of the War’s sesquicentennial and the interactive exhibits make this a worthy detour. From here, the Music City Bikeway continues west. It’s possible to cross the James Robertson Parkway that circles downtown on Charlotte Avenue, allowing a quick exploration of the Tennessee State Capitol and its surrounding Victory Park. From here, I’ll typically make my way back to the river, just a few blocks east, with detours by the famous Ryman Auditorium and the Country Music Hall of Fame, both on 5th Avenue. I’m always sad to leave Nashville. Other cities aren’t nearly as bike friendly. In conjunction with the new Bikeway, the city also launched an awareness campaign called Moving in Harmony, aiming to increase safety for bicyclists, pedestrians, and drivers sharing the same roads. When bicycling in Nashville, I feel safe and respected by drivers. If you’re planning a visit, chart out a day to grab a free bike from GreenBikes and explore the city. You’ll enjoy an outdoor experience that’s impossible to get from the confines of a vehicle, and cover far more ground than you could on foot. If you already live in Nashville, what are you waiting for? If you’ll be near Franklin, TN (just south of Nashville) be sure to check out Franklin Bike Tours & Rentals for a peek at Franklin’s local history and all of the fun hot spots! Have your own bike? Then you’ll have fun exploring these Franklin Bike Trails and Map My Ride Franklin, TN Routes on your own. Want to get away from town? These bike routes on or near the Natchez Trace Parkway will help you explore the quieter side of Nashville. In the self storage industry, Tim Eyre helps customers care for their cherished belongings that must be put in storage. Tim regularly visits his facilities including a Nashville self storage center. He also contributes to the Extra Space Storage Blog where he writes on a variety of storage related subjects.